People First: Why does Wales still build on flood plains? 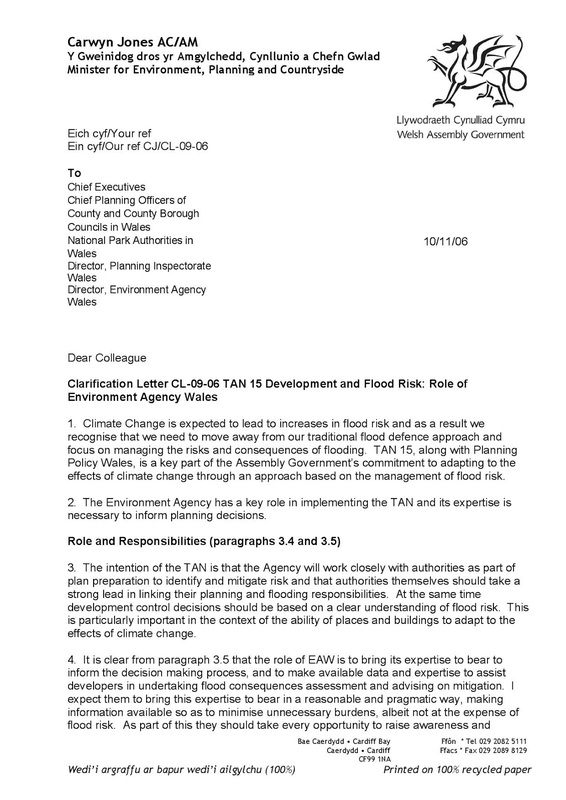 In 2006 Carwyn Jones, Welsh Assembly Minister, issued instructions to the Environment Agency (now Natural Resources Wales) telling them not to object to planning permission allowing building on dangerous floodplains. The evidence obtained by Freedom of Information requests suggests that the decision was probably motivated by pressure to facilitate a financial deal to support the Scarlets, a regional rugby team. A deal which has cost Carmarthenshire County Council (and, by extension, every person living in the area) millions of pounds which we could do with now. It may also have cost the safety of many homes here and throughout Wales. The meat is in the fifth paragraph. The minister states "Therefore EAW may object, not "will" object ...." Basically I believe this phrase means that the environment officers will only object with the express permission of the minister and the normal default position will be to advise means to mitigate flood plain developments by raising land, building dykes etc rather than advise that the building be done somewhere less dangerous to everyone involved. You can see that Peter is concerned that the Scarlets' financial future plans depend on planning permission he believes should be granted to build a large housing development at the site of their current stadium and pitches, which are on a flood plain. Carwyn originally had decided to play by the rules (planning Policy Wales Technical advice note 15).The flood plain is a C2 classification which under TAN 15 should not be built on. But why simply follow the law, when you can re-write it? 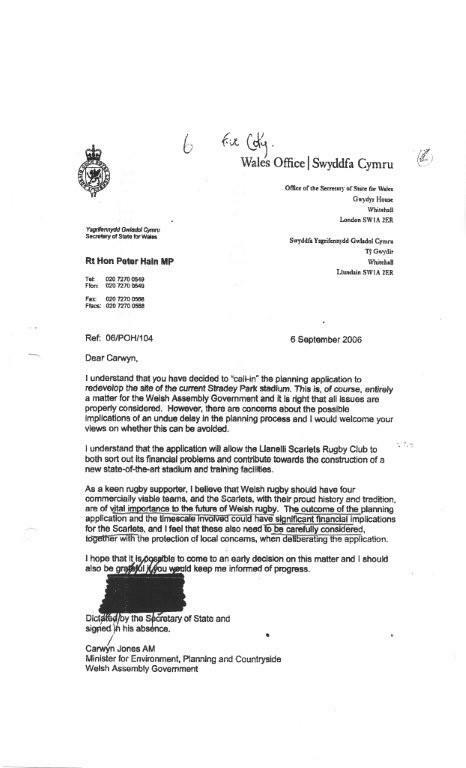 There was no plan B to finance the Scarlets and in 2006 Peter Hain clearly outranks Carwyn Jones. Planning permission was then given on this site as objections from the Environment Agency were withdrawn, A new stadium was built for the Scarlets with mainly public funds from Carmarthenshire County Council. In Stradey and other sites throughout Wales homes have and are being built on land liable to flood under instruction from our own Welsh Government, which pretends to have a policy preventing building on flood plains right up until developers actually want to build on them. The Scarlets did not pay off all their debts as planned and are currently still as insolvent as they were before selling their land for development with Carwyn's help. The people of Carmarthenshire have generously funded a private rugby club and new estates of homes have been constructed in questionable areas as a result of the policy adopted by this weak minister. This man now is our First Minister. How can we trust him? He was prepared to sacrifice the environment of Wales for a "cheap" option to finance a Rugby Club championed by the Secretary of State for Wales. Peter Hain also shows his colours as a callous UK Minister without a thought for the people of Stradey who I now represent as their Councillor. The flood plain at Stradey, did not go away, in fact it is now more extensive. My voters are even more likely to suffer floods as the new homes are raised above ground level, sometimes directly behind theirs. This is not only a party issue, it is one of courage. 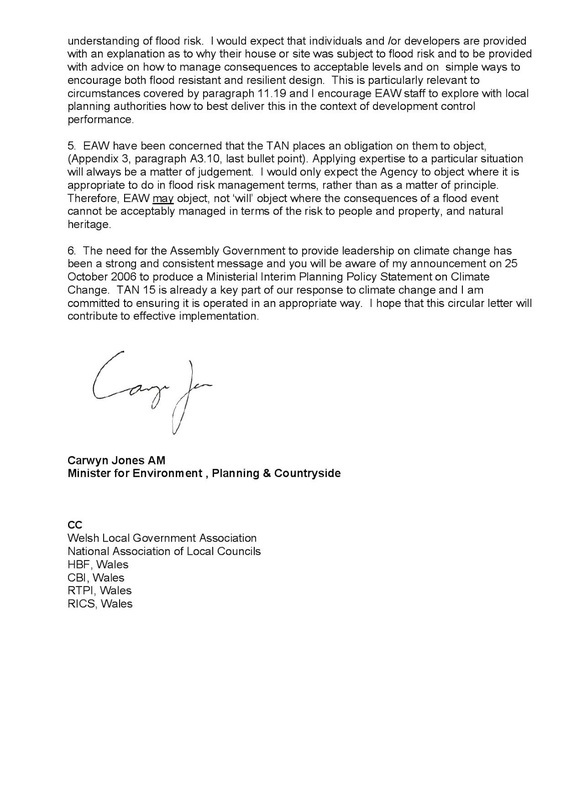 Carwyn, you failed the people of Wales once, hundreds of homes in my area and maybe thousands of homes throughout Wales may have been built on flood plains because you didn't have the guts to stand up to Peter Hain. Have you got the guts to stop this madness now? Most home insurance policies in our area have a cap on the amount they will pay for mold damage mitigation. It is understood that if you do not take immediate action to deal with water damage in your home it is no longer their responsibility to cover the subsequent damages due to neglect.